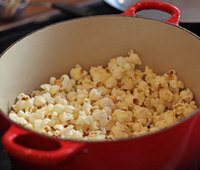 Our foolproof technique for making homemade popcorn calls for nothing more than oil, popping corn, and a hot dutch oven. In a large pot with a tight fitting lid, heat the vegetable oil with 3 kernels of corn over medium heat until the kernels pop. Add the remaining corn kernels, cover pot with lid, and shake the pot to coat the kernels with oil until you hear popping sounds. Stop shaking, and listen carefully until the popping stops, about five minutes.